Costa Rica Adventure Holidays: Experience the Thrills! For anyone who likes staying active on holiday, this adventure-based trip to Costa Rica is sure to fit the bill! It has everything from zip-lining and Tarzan-swinging through the rainforest, to whitewater rafting on Costa Rica's rivers and sea-kayaking on the Pacific Coast. So strap up, dive in, and enjoy! 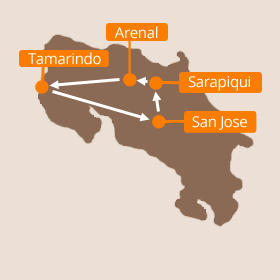 We'll be waiting to meet you at San Jose airport today, as you touch down in one of the world’s most beautiful and exciting countries, Costa Rica! Most international flights arrive in the evening, and we’ll take you straight to your hotel so you can freshen up and head out for dinner. There are plenty of alternative tours available in this area, so you could spend the day hiking Arenal volcano or exploring the jungle canopy in a more relaxed way at the hanging bridges park. Just ask us for more information! If you’d prefer a longer hike, you can spend most of the day trekking this area. Or why not explore by quad, raft, kayak, or bike instead? If you’d like to do all of the above, then no problem! We can organise a day jam-packed with fun activities and watersports for you, just ask! If you’re not quite ready for your holiday to end just yet, we don’t blame you! So why not extend your trip by a few days and take in some more of the country’s wildlife? The jungle area of Tortugeuro National Park, on the wild Caribbean Coast, is a fantastic place to spend a couple of days and see sloths, spider monkeys, tapirs, and even jaguars! Just ask us for more information. Covered in pristine, lush cloud forest, Monteverde has been described as one of Costa Rica's "crown jewels" and it makes a great addition to any holiday in Costa Rica, particularly if your family enjoy adventure activities. From zip-lining and canopy walkways in the tree-tops, to hiking and rafting down below, Monteverde is fantastic fun for all the family. If you'd like to spend two weeks exploring Colombia's Caribbean coast, including the fantastic five-day trek through the jungle to the lost city of Ciudad Perdida... look no further! Our standard price for these Costa Rica adventure holidays is £1350 per person, which is based on two sharing a double or twin room in our standard hotels and lodge.